What Have You Been Watering Lately? Hello and welcome to Week 44 of #HOMwork! We can learn a lot from nature. There are a lot of parallels between how your creativity (both personally and professionally) grows and how a plant grows. What you give your time and attention to will grow, just like a plant would. This goes for both positive and negative attention; if you’re feeding negative thoughts they will persist and flourish. If there’s a part of your life that you’re neglecting it will wilt. Oftentimes, we talk about all the things we want to do, but if we don’t pick up the watering can and tend to those ideas...they will never grow. Consistent maintenance will keep a plant healthy and stimulate new growth, and the same applies for our creative careers. Practicing something a bit each day and dedicating time & care to it will keep us healthy and will ultimately flourish into a thriving skill or career. This week, I want you to pay attention to the things you’re watering in your own life. Where are you spending your time and attention, and is that the best place for it? Are you feeding negative thoughts? Is there an area in your life that is thirsty and needs more tending to? Just like plants, the many branches (heh heh heh) of our lives need different amounts of care to grow to their fullest potential, so take some time this week to consider where to point your watering can next. 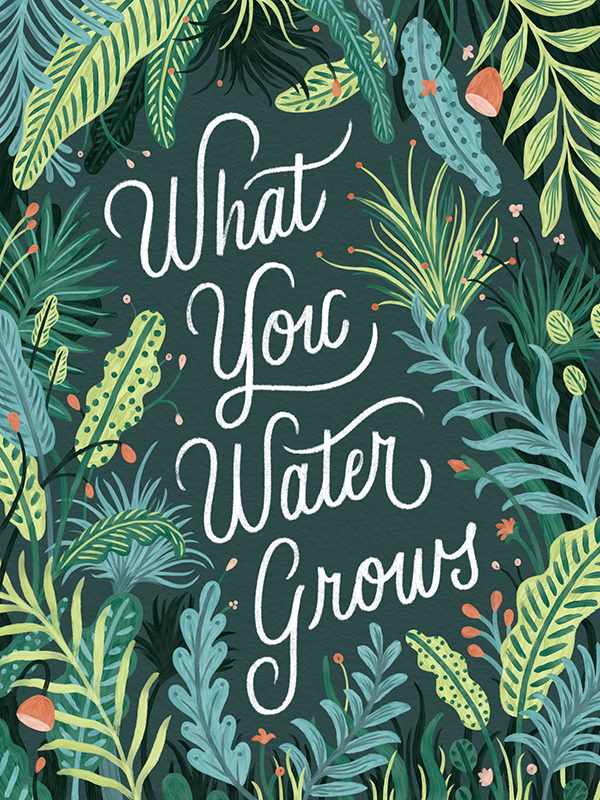 This week's #HOMwork assignment is to letter AND illustrate your favorite plant-related phrase surrounded by your favorite (or relevant to the piece) plants. As always, post your work using the hashtag #HOMwork. In the caption reflect on why the phrase resonates with you and what you're watering these days, personally or professionally! Don’t forget to tag me @homsweethom in your posts so I can see all the gorgeous foliage. I'll be sharing my faves in my Stories all week!